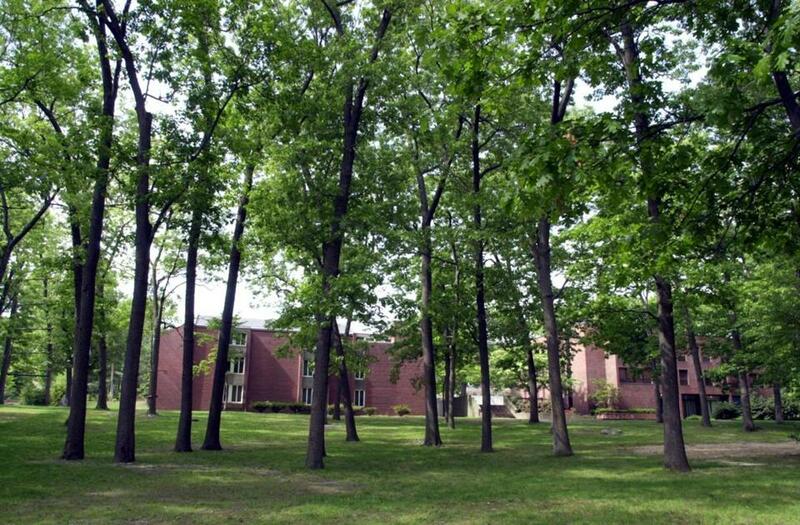 Lasell College and Mount Ida College, both in Newton, are considering merging. Above: Lasell’s campus. In an attempt to stay affordable and competitive, two small liberal arts colleges in Newton are considering merging, the schools announced Saturday. The presidents of Mount Ida College and Lasell College said they hope that combining forces will help keep tuition as low as possible while maintaining the quality of both schools’ academics. The announcement comes as small colleges across the country struggle to stay viable in an era of declining enrollment when families increasingly struggle to afford private college tuition. “We have to find a way to be more efficient on the one hand, but on the other hand still improve the quality of the experience that students have,” said Michael Alexander, president of Lasell, in an interview last week. The merger is not technically cinched but a committee of people from both schools will meet soon and a final decision is expected in the next few months. The schools said the major savings will be from pooling resources and eliminating redundancies. It is unclear when a merger might begin to take place, if approved. In the near future as many more small schools are expected to close or merge, New England will likely see more activity like this. Last year, Wheelock College, a 1,000-student teacher education and social worker school founded in 1888, announced it was in talks to merge with Boston University, its much larger neighbor in the city’s Fenway-Kenmore area. The year before that, the Boston Conservatory merged with Berklee College of Music. In Vermont, Johnson State College and Lyndon State College plan to combine as Northern Vermont University later this year. Alexander, a former corporate executive who has been president since 2007, said he has been discussing the merger for a while with Barry Brown, the former Suffolk University provost who has led Mount Ida since 2012. The schools, which sit 6 miles apart, already share police forces and some back-end technology. “Smaller colleges in this area need to think about what their future is going to be like,” Brown said. Mount Ida and Lasell colleges were both founded in the 1800s as two-year schools for women, and they have both evolved into coeducational four-year schools whose tuition is about $35,000 per year, plus about $14,000 for room and board. Lasell, on Commonwealth Avenue, also is known for its on-campus retirement community, Lasell Village, which the school said would be unaffected by a merger. Lasell has 1,700 undergraduates and 400 graduate students, according to the school. Mount Ida, on Dedham Street, is a traditional liberal arts school with programs including veterinary technology, dental hygiene, game animation, and pre-medicine. It has 1,500 undergraduates and 30 graduate students, according to the school. Both schools said enrollment has been growing. Each school has about 500 employees, including 63 full-time faculty at Mount Ida and 90 at Lasell. Each has about 160 part-time professors, and the average class size at both is about 16 students. Brown said the hardest part about running Mount Ida is keeping tuition affordable. Alexander said Lasell’s top expense is the salaries and wages of its employees, something that could be reduced if the schools share staff. The colleges would also save by having greater buying power and could possibly reduce their debt service by securing a better interest rate, the presidents said. “It offers the opportunity to maintain two beautiful campuses and very small classes and the traditional New England model and at the same time deal with the economic efficiencies that we have to think about in order to keep us affordable and alive,” Brown said. The details of the merger would still have to be negotiated. The schools said students who plan to enroll at either college in the fall will still do so. Course offerings would potentially expand in a merger, the schools said. They did not say whether all staff and faculty would be retained. The merger committee would also explore questions like what would happen to admissions standards and tuition costs. The school would be a Division III school in athletics. A merger would not affect alumni degrees, the schools said. Mount Ida is also in the process of selling several acres on its campus to a developer who plans to build a neighborhood of eight single-family homes. The plan has met some opposition from neighbors. Brown said that transaction is unrelated to the merger. Brown said the hardest part of merging will likely be the sense of loyalty that people feel to their school. The colleges compete in sports and students socialize on weekends. “Having been somewhat friendly rivals is going to be the adjustment,” he said.